It was a big day at the Langley-Wilson household Saturday. In addition to Louisville playing for the Big East title (Wow what a comeback win! ), it was also the birthday of Maia’s oldest son Gabriel. It was the big 1-0. You only go from single digits to doubles once, so a celebration was in order. 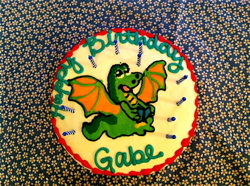 It was going to be a full house, as cousins, grandparents, aunts and uncles would be in attendance for Gabe’s birthday party. I was cooking for 15, so I wanted to come up with something that I could assemble en masse, instead of cooking individually, where I might have to monitor 15 different meals. After floating a couple recipes past the birthday boy we settled on Sweet Corn and Shrimp Risotto. With temps in the mid-60s Saturday, it was a beautiful spring day, and felt all the better considering most of the week had been dreary and cold. It was the perfect day to break out some seafood and act like summer had arrived. Some of this meal could have been prepped the night before and it would have made my life easier, but procrastination ruled, which meant I had a full day of cooking ahead of me. I figured I better set up an appetizer to appease the natives if dinner ran late, so I stayed with the shrimp theme, and took a shot at making shrimp toast. This is one of my favorite Thai appetizers – but I’ve never attempted it. I also wanted a bread element, so I did some French Gougères (pronounced goo-SHARE). These are essentially drop biscuits infused with cheese. 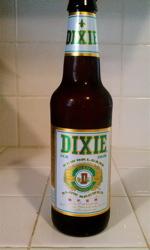 This New Orleans lager is one of my favorites, and goes great with seafood. Since all of Kroger’s shrimp was frozen I went with the Gulf shrimp. It has more flavor, but means I was peeling and deveining four pounds of shrimp. Then I hit Lowe’s for some party supplies, Red Dot, twice, for liquor and such, before finally getting into my kitchen around 3:00 p.m.
Now guests were arriving at 4:30, so I needed to boogie, and fast. First things first, I needed tunes. I like to cook with music on, particularly New Orleans music, so I chose a Preservation Hall Brass Band mix to get the mood right. I had been drinking coffee since I got up and was staying with that until the pot was empty. Next I called my mom, because that’s what a boy does when he’s in a pinch. She brought over her sweet Cuisinart food processor. There was no way I was going to get this done alone in time, so I put mom to work. 4 ears sweet corn; 6 cups chicken broth; 1 1/2 pounds shrimp (shelled and deveined); 1 teaspoon grated lemon rind; 1/4 teaspoon salt; 1/4 teaspoon pepper; 4 tablespoons butter; 2 cups chopped onion; 1 leek (white part only, quartered lengthwise and sliced); 3 cups Arborio rice; 1 cup white wine; 1/2 cup sliced scallions; 1 tablespoon chopped fresh basil; 1 tablespoon sliced chives. 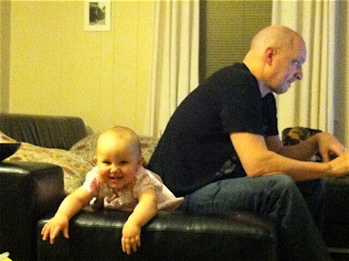 Dad and my baby girl. Pour all the chicken broth into a medium saucepan; bring to a boil, then reduce heat to low to keep broth warm. I chose to pan fry the corn; place ears in a covered pot with enough olive oil to coat the bottom of the pan; season with a few shakes of salt & pepper; cook about 12 minutes over medium heat, turning the ears occasionally as they brown. Get the onions, leek, scallions and chives chopped while the corn cooks. Set the corn aside to cool. We shelled all the shrimp next. Cut the corn off the ears and set aside (don’t be tempted to use frozen or canned corn, it doesn’t have nearly the flavor of fresh sweet corn cut from the cob). Toss shrimp in a bowl with the lemon rind, salt and pepper. In a large, deep pan or Dutch oven, melt 2 tablespoons of butter. Add shrimp; cook and stir just until pink, about 3 minutes; remove to a bowl and reserve. In the same pan, melt remaining 2 tablespoons butter. Add onion and leek; cook for 5 minutes until tender. Add rice; stir until combined and rice is hot. Add wine; cook and stir until the wine has almost evaporated, 5 minutes or so. Add 1 cup of the warm broth. Cook and stir continuously until the liquid is absorbed, and gradually incorporate the remaining 5 cups, until the rice is tender and creamy. It will take between 15 minutes and a half hour. The finished product: Sweet Corn & Shrimp Risotto. If additional liquid is needed, add 2 tablespoons water at a time until creamy. One twist to this meal was Maia’s little sister, Meg, had recently developed an adverse reaction to shrimp, which I didn’t know until she arrived at the house. So I continued to prepare the risotto, right up until the shrimp was added. I pulled out 1/3 of one batch and cooked 1 pound of chicken breast to supplement. 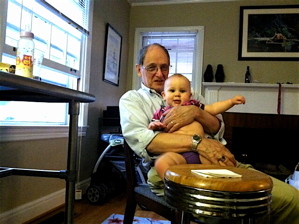 My mom and I were having a blast in the kitchen, so we took our time with the cooking, told stories, laughed, and sipped wine along the way, stopping to take in some birthday festivities, and play with my 11-month old baby, Isabella. I switched music and went with one of my favorite Iowa guys, William Elliott Whitmore, and his CD “Ashes To Dust.” There is a stark antiquity to Will that fit our work in the kitchen. We kept the beer and wine flowing to make sure all were happy, then jumped on getting appetizers out while the broth was being absorbed into the risotto. 32 diagonally sliced 1/2 inch thick baguette slices; olive oil; 1/2 pound raw shrimp, peeled and deveined; 1 large egg white; 2 1/2 teaspoons sake; 2 teaspoons finely grated fresh ginger; 1 large garlic clove minced; 1 1/2 teaspoons hot sauce; 1 1/2 teaspoons toasted sesame oil, divided; heaping 1/4 teaspoon kosher salt; 1/4 teaspoon sugar; 4-oz can water chestnuts finely chopped; 2 scallions (about 1/4 cup); 1/4 cup mayonnaise; 2 teaspoons sesame seeds. 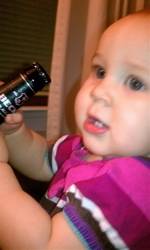 Isabella was all about my Beck’s Sapphire. Cut approximately 32 slices from a fresh baguette. On a rimmed baking sheet, arrange the slices in a single layer. Brush the top side with olive oil lightly and place into the oven on the center rack for 4 minutes. Remove from the oven and turn over each slice, then set aside. In a food processor, combine the shrimp, egg white, sake, ginger, garlic, hot sauce, 1/2 teaspoon of sesame oil; salt; and sugar. Puree until smooth. Transfer to a bowl and add the chopped water chestnuts and scallions. In a small bowl stir together the mayonnaise and remaining 1 teaspoon of sesame oil. Mound a rounded tablespoon of the shrimp mixture on top of each toast and spread evenly over the toast. Brush the top of each mound with some of the mayonnaise mixture, then sprinkle with sesame seeds. Bake on the oven’s middle shelf for 12 to 14 minutes, or until the shrimp mixture is just cooked through. Serve hot. Almost done now, time to amp up the music a touch – bring on the Widespread Panic. 1 cup grated Swiss or Gruyere cheese; 1 cup water; 5 tablespoons butter; 1 teaspoon salt; 1/4 teaspoon ground pepper; 1/4 teaspoon ground nutmeg; 1 cup all-purpose flour; 4 eggs (room temperature). Preheat oven to 425 degrees. In a medium saucepan bring the water, butter, salt, pepper and nutmeg to a boil. When the butter is melted remove from heat. Slowly add flour to the butter/water mixture; beat with a wooden spoon until mixture leaves pan sides clean. Add cheese and beat until incorporated. Beat in 3 of the eggs one by one, until thoroughly absorbed. Add extra flour if necessary. Beat until mixture is smooth, shiny and firm. Drop by small spoonfuls onto a greased cookie sheet. Beat remaining egg with 1/2 tablespoon water, then brush tops of uncooked puffs with egg wash.
Bake in upper third of the oven for about 20 minutes or until golden and doubled in size. The recipe should make 18 to 24. As this baked I went back to my risotto and stirred in the corn kernels, shrimp and scallions; cooked that until items were reheated. Season with salt and pepper if needed. This will make 8 to 10 servings; divide equally, and garnish with basil and chives. 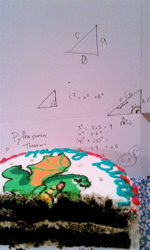 Solving for X was not exactly my idea of after-cake fun. It was just after 7:00 p.m. when everyone was served and happy. The shrimp toast was amazing! I wish I had made a double batch. Next time I might double the shrimp content as an experiment and make them more decadent. The risotto was like butter. The sweetness from the corn mixed beautifully with the shrimp. It went perfectly with a glass of Pinot Grigio or Sauvignon Blanc. And the timing was perfect because everyone had a chance to eat, we did birthday cake and candles – then the Louisville game tipped. The Llama and Peanut blowing down with some basketball after a long day of cooking. 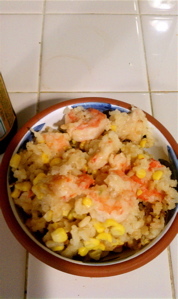 This entry was posted in Family, Food and tagged Sweet Corn and Shrimp Risotto. Bookmark the permalink.